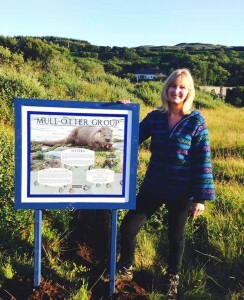 The first of a planned series of Information Boards depicting the role of otters and Mull Otter Group on the island has been unveiled. This eye-catching information board has a new home at Beach car park on Loch Scridain, where it will, hopefully, be seen and read by lots of visitors to the island. This initial board has been kindly sponsored by Holiday Mull and Iona and was installed by MOG committee members Jane Stevens, Dave Underwood and Nigel Burch earlier this week. “Otters are an integral part of everyday life on Mull and Iona and help to generously boost the local economy by attracting visitors to our islands. 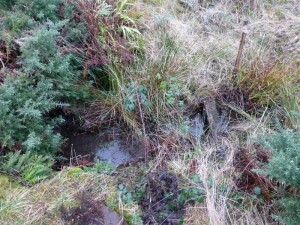 The second phase of Mull Otter Group’s ‘Healthy Culvert’ campaign is due to take place on Sunday 16 February. Meeting at the public car park at Craignure at 10.30am, volunteers plan to inspect, clean and clear blocked drainage pipes along a stretch of road known to be a high risk for passage otters. This follows on from last month’s successful morning when a first batch of unhealthy culverts was identified and renovated, making them more attractive and safer for commuting otters. This is a project that is ongoing and one that will have to be repeated at regular intervals in future. “Drainage culverts can easily become blocked or waterlogged depending on the weather. Otters do employ roadside culverts in order to safely navigate roads, but do so in an inconsistent way. This is largely down to poor weather causing culverts to silt up and become blocked. There is, however, no guarantee that clearing culverts will prevent otters from dying on Mull’s roads, yet such remedial action may help safeguard the lives of some animals in future by giving them an option. Culvert clearing can be good fun, giving members a chance to meet up and get to know each other, while making a positive contribution towards local otter conservation. So, if you have a few hours to spare and fancy lending a helping hand, please contact Ruth Fleming (01688 301213) for further details. The second rescue cub has settled in extremely well to its temporary home at the International Otter Survival Fund’s Rescue Centre on the Isle of Skye. This feisty male, believed to be around four months of age, has been given the name ‘Mangal’ by Heleen van Haaren from Lochdon, who found the cub and alerted Mull Otter Group to its distress. Mangal is the name of Heleen’s young nephew (who lives in Holland) and is a name that is associated with resistance fighters throughout Asia. It appears that both Mangal and his otter namesake share several similarities, most notably their love of fishing. ‘Mangal’, the otter cub, continues to build up its strength at the IOSF Rescue Centre on the Isle of Skye, where he is now consuming two whole fish a day. He is still a fiery, little character, but he now has the company of another young cub to help keep him in check. Mull Otter Group would like to acknowledge a ‘Year of Natural Scotland’ grant of £250 from Holiday Mull and Iona, which has allowed the purchase of an Otter Rescue Resource package, to be used when handling sick, injured or distressed otters. A young otter abandoned on the Isle of Mull has been rescued by members of the Mull Otter Group (MOG) and transferred into the care of specialists on the Isle of Skye. The infant cub, thought to be as young as eight weeks, was located at Loch Scridain, in the South of the island , by MOG member, Nigel Burch. Nigel, a local otter expert, who has been studying these mammals on the Isle of Mull for the past 25 years, said: “It is very unusual for otter cubs to leave the sanctuary of their natal holt before they are at least 12 weeks of age. As the cub was becoming increasingly distressed and in danger of dying, the Mull Otter Group sprang into action with a plan to rescue and rehabilitate the baby otter. 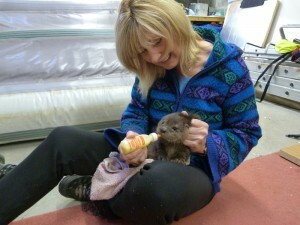 After being picked up, the infant otter was taken into the care of Jane Stevens, the Chair of the Mull Otter Group, who initially fed the cub with a prescribed formula of water, sugar, salt and baking powder, in order to rehydrate the unfortunate animal. This feeding regime was undertaken every 3 hours over a 48-hour period, until the otter was deemed well enough to travel to the Isle of Skye for the main part of its rehabilitation. With the assistance of Ruth Fleming, the orphaned cub was transferred into the specialist care and support of the International Otter Survival Fund (IOSF) based on the Isle of Skye. A second young otter cub, believed to be a male and as little as 10 – 12 weeks old, has been found in the South-east of the island displaying unnatural behaviour towards members of the public. 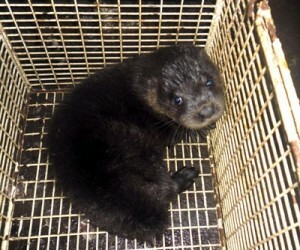 On investigation by members of the Mull Otter Group, it was thought in the best interests of this animal to arrange for it to be picked up and taken into care of experts at the Otter Rescue Centre on the Isle of Skye. The Mull Otter Group would like to thank Dr Frank Teunisse, Heleen van Haaren and Jenny Smith for highlighting their concerns regarding the behaviour of this animal and to Ruth Fleming and Stuart Gibson, who kindly agreed to transport this young cub from Mull to the Isle of Skye. Unfortunately, the first cub to be found has since succumbed to its trauma while in rehabilitation at the Otter Rescue Centre. 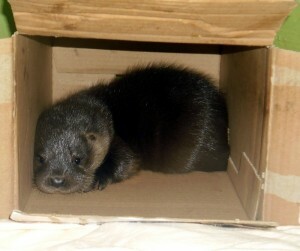 However, the second infant otter appears to have settled in quickly to its new surroundings on the Isle of Skye. Initial signs appear good for this young Isle of Mull otter and it is everyone’s wish that its rehabilitation continues at pace and that one day it will be re-released back into the Mull countryside. The Mull Otter Group has been extremely active behind the scenes promoting the welfare and conservation needs of the island’s otter population in recent months. After a few technical problems, the Mull Otter Group Facebook page is now active and receiving positive feedback from the otter-friendly world; a web-site has been established and is currently under construction; and an informative leaflet, ‘Otter Watching On Mull’, written by local ecologist, John Clare, is in the process of being printed. “Inevitably, greater awareness of local otter issues will mean an increased number of reports of sick, injured or abandoned animals from well-meaning members of the public. As with any embryonic group, the Mull Otter Group has to learn to walk before it can run. However, the initial support from the local community and experts at the International Otter Survival Fund has been extremely positive.